At HOPE we like to keep our students, volunteers, donors and the community up to date; on our activities and news of program offerings, student successes, volunteer contributions, donations and in general everything that is happening at HOPE. 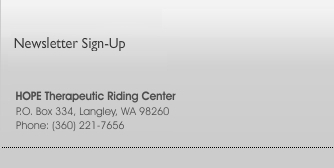 We want everyone who could benefit from therapeutic riding to learn about HOPE! If you have ideas about how to get our news out, please let us know. Please click here for the latest newsletter from HOPE. If you would like to receive HOPE’s newsletter please sign up below.